The Halifax Reader - Halifax Public Libraries: M.C. 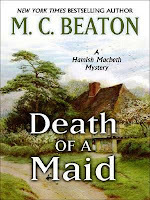 Beaton’s Agatha Raisin and Hamish MacBeth series Readalikes. M.C. Beaton’s Agatha Raisin and Hamish MacBeth series Readalikes. Interesting to note: Abe books claim M.C. Beaton has actually outsold J.K. Rowling in their 2008 sales. The Agatha Raisin series take place in the Cotswold’s of England. The setting is charming, relaxing and yet Agatha seems to be constantly causing friction by her antics and personality. Lillian Jackson Braun- The Cat Who series takes place in fictional Moose County, United States “400 miles north of everywhere” and the main character Qwilleran is like-able from the moment you “meet” him. However, you will find this series to have the same mood of tranquility. The quirkiness in the series comes from Qwill’s cats KoKo and YumYum and his relationship with them while he solves crimes with their indirect help. Finally one can not forget the classic mystery writer Agatha Christie with her enigmatic protagonist Miss Marple. Miss Marple, living in an English village has many quirks and appears to be somewhat dimwitted or “fluffy” however, she in fact possesses a sharp logical mind. Although Ms. Marple is not as verbally sharp (in the negative sense) than Agatha Raisin, the reader will enjoy the subtlety of her sense of humor. The Hamish MacBeth series written by M.C. Beaton take place in the Scottish Highlands and features an under achiever/lazy Hamish who solves crimes because of his natural “Highland curiosity.” This series is so popular they have made it into a BBC television series. Catherine Aird’s Inspector Sloan series is set against a British backdrop featuring Detective Chief Inspector Sloan and his slow-thinking helper Detective Constable Crosby. The humorous tension in these novels is found between Sloan’s cranky but driven superior, Superintendent Leeyes and himself. Sloan likes to tend to his roses, when he has time, to relieve his stress; reminding the reader of the under achieving Hamish Macbeth.